Part 2 of this article follows a compilation of the three main syntactic functions of ama (auxiliary, article, evidential) with their various uses and their semantics and functional variants in part 1. The process of grammaticalization is laid out with examples. A relevant analysis by means of RRG methods confirms and concludes the interpretation of the various semantic/syntactic functions of ama in Omaha-Ponca as a multiple-staged process of abstraction from semantics to morphosyntax. (1)   the  niashinga gahithe ame ama,      ethegon-bi-ama. Following Rankin (1976), Eschenberg interprets this example (1) as the starting point of the process of grammaticalization. ama as an existential auxiliary functions as a predicate of existence here, which in RRG places it in the nucleus. The next stage of grammaticalization can be seen by way of the example pair (2) and (3). Note that (2) are 2 separate sentences. In the first, ama is the (existential) plural predicate ('are/were') — thus in the nucleus, while the second is a verb-only sentence, but marked 3PL, thus referencing te 'buffalo' deictically. In (3) on the other hand, we have a single sentence, where the verb eat is the predicate, while ama therfore no longer functions as a predicate, but as a plural definite article and in terms of RRG becomes a nuclear modifier (or operator). This represents a higher stage of grammaticalization. "(...) the location of an NP as outside one’s vicinity can be extended to a clausal notion of the entire clause being located in another space. In narrative, this marks that the narrator is narrating events from outside the storyworld (reportive stance). This notion can then be extended from the clause to the information within the clause being located elsewhere. In conversation, this creates sentences (...) which are not personal knowledge." That leads to the next stage of grammaticalization, the employment of ama as an evidential (reportative, quotative, hearsay), which corresponds to a higher level of abstraction extending the scope of the evidential to clausal level. Depiction of the grammaticalization stages of Omaha-Ponca ama in RRG operator projection. After Eschenberg 2004: 89. In the tree representation it can be seen that the origin of ama is the nucleus (a). 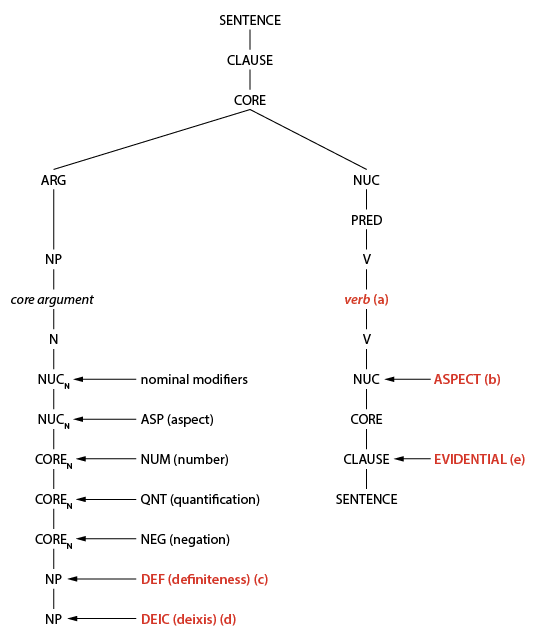 The next stage of grammaticalization exhibits both a nuclear operator (aspect) (b), and an NP operator (definiteness) (c). The third stage of grammaticalization is an NP operator (definiteness) (c), this time without nuclear operator (aspect). The NP operator in turn grammaticized to the next stage as a deictic NP operator (d). And finally, the evidential clausal operator (e) represents the highest stage of grammaticalization of ama. The tree representation also reveals and confirms that grammaticalization involves a change of scope from narrow to larger scope. Eschenberg concludes by ascertaining that the findings regarding ama are fully in line with both Kuryłowicz’s ( 1975: 52) definition of grammaticalization, and with Traugott's definition of subjectification in the context of grammaticalization. He also notes that RRG, though conceived as "a primarily synchronic syntactic theory (...), provides motivating insight into diachronic processes." This entry was posted in Grammaticalization, Omaha, Ponca, Role and Reference Grammar and tagged diachronic change, evidentials, grammaticalization, RRG, scope, trees. Bookmark the permalink.